For Bannor Starfist, the savant of reality, nothing is easy... including getting married. Creation, annihilation, perpetuity... the words boom in Bannor's mind through his magical nola powers. The message is just a precursor to another big mess done Garmtur style. 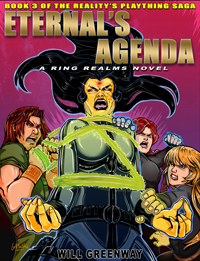 Daena, the savant of attractions turned immortal goddess, is up to something and Advocate Eternal Koass is anything but happy. Bannor goes to Eternity's Heart to speak on Daena's behalf and ends up the Shael Dal's latest draftee. The Protectorate has a problem. A million blood-thirsty war-mages are running rampant through the Ring Realms destroying everything they come in contact with. The difficulty is, nobody can find them... except maybe someone with the reality bending power of the Garmtur Shak'Nola.